Though comics have taken hit, Feiffer optimistic on form: "May well be one of the golden ages"
(CNN) -- The comic strip was originally called Sick Sick Sick, but it wasn't about ghouls or horror or any of that "Tales from the Crypt"-type stuff. In the Eisenhower era, its subject matter was even scarier: Neurosis. Conformity. Politics. Oppressive mothers. Much to cartoonist Jules Feiffer's surprise, as he recalls in his new memoir, "Backing into Forward," the strip -- a weekly feature in a then-new "alternative" newspaper called the Village Voice -- caught on. And Feiffer found himself a spokesman for intellectuals and misfits, all those people who dared to question the status quo. 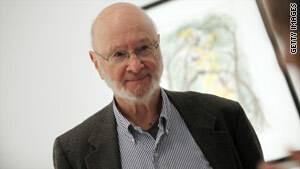 "It was an accident of timing," said Feiffer, 81. "I happened to come along at what was considered at the time the very bland, conformist '50s. Nobody understood -- maybe I didn't -- that underground, beyond all that conformity, all these things were happening." He became one of the most influential cartoonists of the latter half of the 20th century, a Pulitzer Prize winner for his long-running artistic commentaries. Doonesbury, in particular, owes Feiffer a debt -- one Doonesbury cartoonist Garry Trudeau has frequently acknowledged -- and so do any number of other cartoonists. "I think his work was groundbreaking," Mutts cartoonist Patrick McDonnell said, adding that one of his earliest memories was perusing the book compilation of Sick Sick Sick. "I think he was the first cartoonist who really did sophisticated, more adult-oriented themes [that were] kind of autobiographical. And today, I think the whole underground and alternative graphic novel comes from Jules." 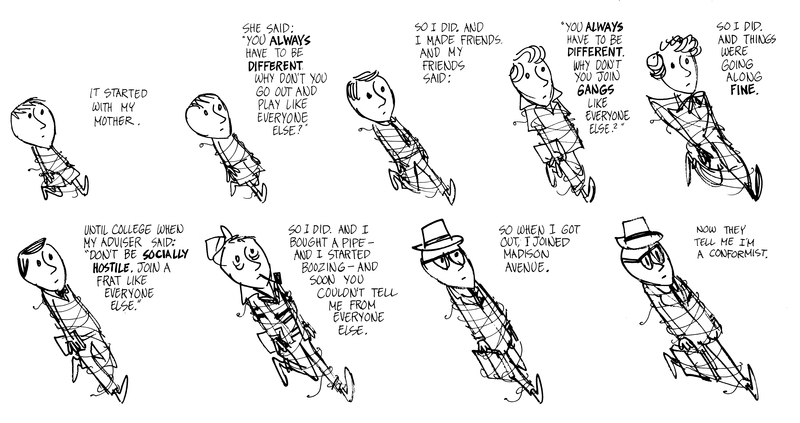 Jules Feiffer's comic strip and outlook influenced a number of cartoonists who came after. Lucy Shelton Caswell, curator of the Billy Ireland Cartoon Library and Museum at The Ohio State University, echoes McDonnell. "He studied at the feet of a couple of the masters -- Milton Caniff and Will Eisner -- and he took what he learned from them and made it his own," she said. "In terms of artistic style and content, he really made a difference." Feiffer is quick to acknowledge his influences: Walt Kelly's Pogo, with its politically aware animal residents of the Okefenokee Swamp; New Yorker cartoonists such as Saul Steinberg and William Steig; and especially Eisner, the Spirit creator for whom Feiffer worked in the late '40s and under whom he drew his own strip, Clifford. But there's one influence that's unique to Feiffer: his mother, Rhoda. Telling stories about his mother wasn't Feiffer's intention. "The two things I knew I wasn't going to write about was my mother and my Jewishness," he said. "And, of course, they became the central themes of the book." But as he cast his mind back to his working-class Bronx childhood, one memory leading to another, Rhoda Feiffer was hard to avoid. She was a cold, belittling, commanding woman who had given up her own artistic dreams and was convinced that her son, like his father, was doomed to disappointment. 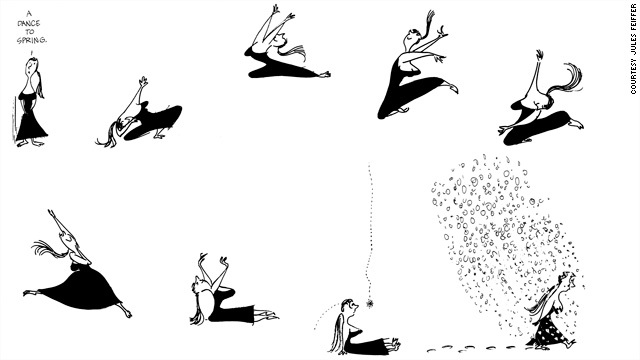 "I've suspected for a long time that mine was a virginal birth," Jules Feiffer writes in "Backing into Forward." Her influence played out in any number of his strips featuring put-upon men, questioning children and recurring characters such as his dancer, forever offering "a dance to" something and being cruelly awakened in the final panel. I think the whole underground and alternative graphic novel comes from Jules. But the real-life Feiffer was also equipped with a sense of perseverance and adventure. In "Backing into Forward," he writes of hitchhiking across the country in his late teens; avoiding the worst aspects of military service by playing into the vanity of his superiors (he and a pal painted elaborate helmet liners); and branching out into other genres, including playwriting, screenwriting and children's books. It has paid off with such classics as the play "Little Murders," the screenplay for "Carnal Knowledge" and such books as "The Phantom Tollbooth" (for which Feiffer did the illustrations) and "Bark, George." "I think the diversity of his output is very interesting. He has been able to find publishers for work that I think is quite remarkable, given the incredible range of subject matter. It's interesting that someone who makes such pointed political commentary can write such charming children's books," Caswell said. Indeed, Feiffer has often taken unlikely paths. 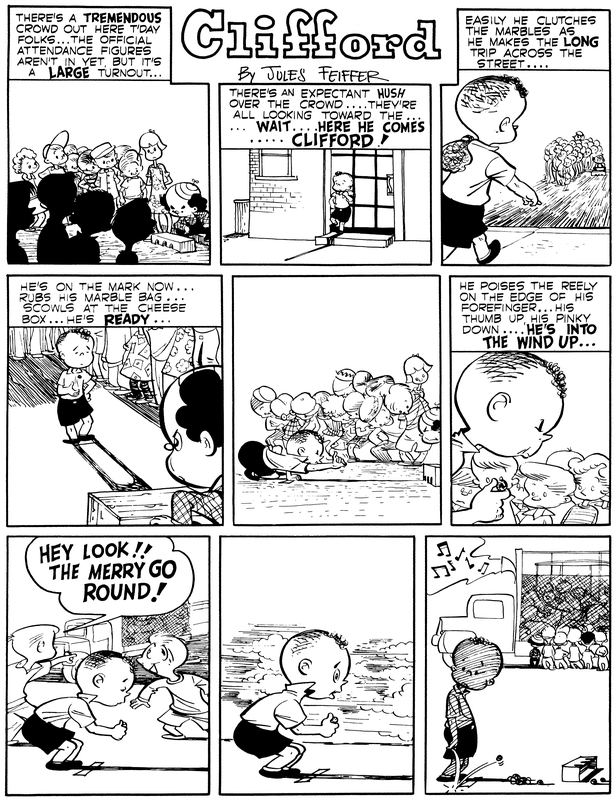 His strip was never widely syndicated and always kept its base in the Voice. And when he's done the expected thing -- for a short time, he used his characters in advertisements, not unusual for cartoonists -- he's backed off. "A lot of people don't see advertising as I do," which is as manipulative and deceptive, he says. "If I was trying do cartoons [to] tell the truth and then do an ad, I can't defend that." He and Charles Schulz disagreed about the use of Schulz's Peanuts characters -- ironically, as questioning and neurotic as Feiffer's -- in ads, with Feiffer saying he was "very upset" with Schulz's merchandising. The two were admirers of each other, though, he adds. In recent years, Feiffer has been a victim of newspapers' decline, with his strip unceremoniously dumped by the cost-cutting Voice in 1997. (It's a far cry from the treatment his idols received; Caniff earned the cover of Time magazine when he ended Terry and the Pirates in favor of Steve Canyon.) But you won't find Feiffer, who now teaches a course called Humor and Truth at Stony Brook Southampton, looking at the glass half-empty. "This may well be one of the golden ages of the form," he said. Though he observed that newspaper comic strips are struggling, such alt-comic artists and graphic novelists as Chris Ware, Dan Clowes and Art Spiegelman have given cartooning new life, he says. Indeed, one of the reasons for teaching -- and writing the book, for that matter -- is to encourage young people so they don't hear the cautionary voices of their own mothers, and other grown-ups, too loudly, he says. So, could it be that Jules Feiffer -- chronicler of the fearful, the anxious, the uneasy -- is an optimist? He seems surprised at the question. "Oh, God. If I wasn't optimistic about the work I was doing, and the eventual success of it, how in the world could I have this career?"